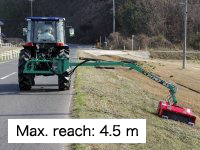 ※１Depending the tractor’s model, 4,100 mm maximum reach can be selected. 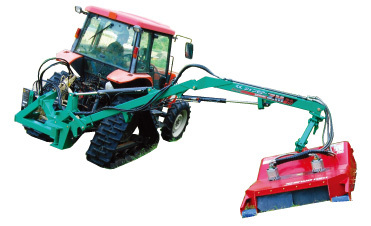 ※２Depending the tractor’s model, 4,200 mm maximum reach can be selected. The ZM-45, ZM-3709, and ZM-3708 have maximum work reaches of 4.5, 3.7, and 3.6 m, respectively. Long-arm-type models make it possible to mow areas that are not reached by conventional models, difficult-to-work slopes over guardrails, slopes over irrigation canals, and comparatively long slopes. [ZM-45 and ZM-3709] Rotary Mowers dedicated to flat area mowing. Adopts a rotary mower dedicated to flat area mowing. Four blades in total are provided to the upper and lower tiers, which powerfully cut long grass finely with improved performance a step higher than that of conventional models. Adopts a hydraulic-driven two-side rotary mower. Possible to mow the upper and slope sides of road shoulders and dikes. The mowing width is 800 mm in the case of mowing flat areas. ・Equipped with two high-torque hydraulic motors for improved mowing performance. ZM-45: A mowing rate of 3,800 m² per hour at a speed of 5 km/h. ZM-3709: A mowing rate of 2,700 m² per hour at a speed of 3.5 km/h. ZM-3908: A mowing rate of 1,700 m² per hour at a speed of 2.5 km/h. Mowing road shoulders and slopes. Mowing paddy fields, dikes, slopes of waterways, orchards, and fallow fields. Mowing factory sites, orchards, gold courses, health resorts, and common housing areas. The mower can be set on four positions, i.e., the right-hand side, rear right-hand side, backside, and rear left-hand side of the driver’s seat, which allows a wide variety of work, such as grass mowing and transfer and the removal of the mower. If the arm is set on the driver’s seat, the mowing part will be just beside the driver’s seat, which makes it easy to check the operation and obstacles from the driver’s seat and ensures comfortable long operating hours. 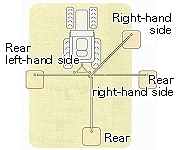 Moreover, the right-hand rear position allows work with the maximum reach. The arm can be flexibly operated at the flip of the one-lever joystick, which ensures tireless work for long hours. Incorporates a magnet-type controller that can be located in desired ease-to-operate positions. The mower is in floating control according to the undulation of the ground, thus realizing comfortable work without mower angle or height adjustments. Realizes high-precision mowing with the mowing height of grass stabilized. Incorporates an exclusive flow control valve. Incorporates an electromagnetic valve provided with a flow control valve developed exclusively for the BM series, thus maintaining the rpm of the mower constant and ensuring stable mowing. Mounted to the three-point link of a tractor as well (provided that a hitch frame is used). The auto hitches (S and L hitches) of the Japan Farm Machinery Manufacturer’s Association ensures easier mounting and dismounting. 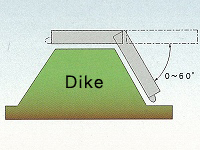 Provided with a stand with a castor thus ensuring ease of moving the separating block. Provided with hydraulic extraction parts. Allows mounting together with a docking loader. Provided with a three-point link, thus making ease of mowing possible with a docking loader and front work machine connected. Ease of mounting to tractors. 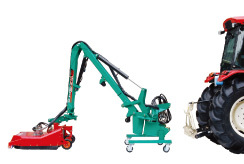 Easy to make preparations with the mower connected with the three-point link and the hydraulic extraction parts assembled. Adopts an electromagnetic system, thus ensuring ease of mounting to cabin tractors. Mounted to your tractor with ease, thus increasing the operating rate of the tractor. The Road Trucking Vehicle Law prohibits tractors mounted with the Twin Mower to run on public roads. Keep the machine well maintained.